Happy Hump Day loves! :) I wore this bright outfit over the weekend when the hubby and I grabbed an early dinner. I am so smitten with this candy-colored necklace by the talented JenHoddenpyle. It's so fun! I knew this bright fushia blazer would look great against it's rainbow colors! And I have to say that these Lucky jeans are incredibly soft and oh-so-comfortable. The button-fly really makes a difference with the fit when it comes to this growing belly of mine. I'm starting to find that some of my fave jeans aren't the comfiest anymore -- their getting snug and really hard to wear for an entire day. Think I'm going to start moving into maternity jean territory for more comfortable fits. Lovely! just obsessed with all of the hot pink in this outfit! You look adorable...love this necklace! Loving the colours going on Jen, you look amazing! Each piece of the outfit is a favourite for me...the necklace, the pink blazer, the heels, the clutch-ahh it is all so good! I am in love with that necklace. It's perfect. you look so cute! love this entire, so classy & chic! I also love that necklace, I want one bad!!! Where has that necklace been all my life? Beautiful! love that JenHoddenpyle necklace! I keep seeing her stuff on instagram, it's so cute!! I love the bright pink on you! This is such a cheerful outfit!! your necklace is sooo pretty!!! that necklace is fire! 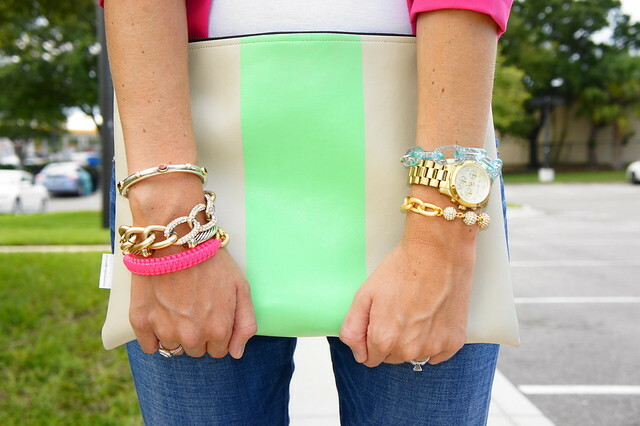 all the neon looks super polished :) and you might already know, but shopbop has a TON of maternity jeans. you don't look a pound heavier to me! The necklace is amazing! Even though it's so bold, I like that you paired it with the bright pink blazer. Love your outfit!!! Specially the blazer, so beautiful and perfect. one of my fave looks of yours recently! love love love the necklace!!!! !